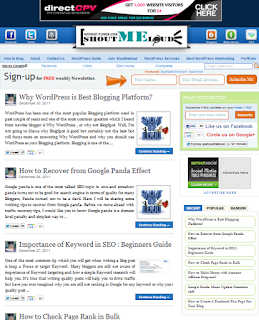 ShoutMeLoud is a popular well furnished and useful Blog. ShoutMeLoud template is really so awesome and cool, But SEO Friendly. I think every New or Pro Blogger must have this template which was made by the Popular Blog named ShoutMeLoud author Harsh Agrawal . So I'm sharing you this template for free Download, Because ShoutMeLoud has also a very good template like other blog's template or just like our template, So I made a decision to make a clone version on ShoutMeLoud template and give it for free to use. But, If you are going to use this free ShoutMeLoud Cloned Template, Please put a ShoutMeLoud credit link on the footer. Email Subscription widget at the nav bar. Custom Logo for you Brand. SEO enabled for high traffic. Do You Like widget at the footer. Social Sharing icons below post body. SML like Recent,popular post at right sidebar. 0 Response to "Download and install free ShoutMeloud Blogger template Here"